Standard bank can be said to be South Africa’s largest bank with offers to customers a wide range of financial services. By financial services, we mean that they provide regular commercial banking services. They also offer Forex, investment and insurance services among others. Standard bank can be found in over 15 countries in Africa alone and in key economies around the world. In Africa, the bank is found in but not limited to South Africa, Ivory Coast, Nigeria and Uganda. In the rest of the world, you can find them in the United Kingdom, Russia, Turkey, and Argentina. You should note that it is not limited to the above-listed countries. It aims to use its strengths to build an organization geared towards financial services focused fully on Africa. Businesses which the bank revolves around are; investment banking, personal and business banking and wealth management. Standard bank website can be accessed by anyone who has an internet connection. 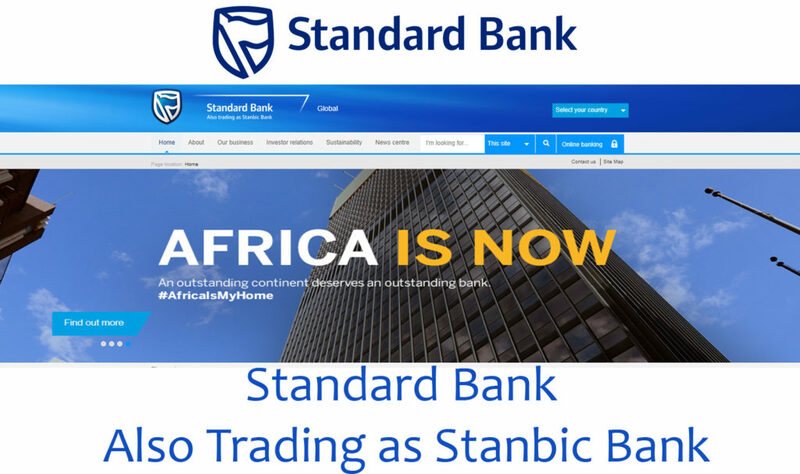 One must type in this URL To get to the official website of standard bank, standardbank.co.za in their browser. To get to standard bank group site you must type in the URL standardbank.com/pages/StandardBankGroup/web/index.html into your browser. On the home page of the banks official website, you get to see a general summary of all what the bank offers. You also get to see the latest news updates which relate to them and their branches worldwide. The website menu has information which customers might need to perform their banking business. On the menu there is the About Us column. This has a sub-column that contains everything you will like to know about the company. From careers to investor relations, media center and so much more. The Personal column contains information about the bank’s commercial banking business. This ranges from banking, borrowing, investing and more. The Business menu has a similar information to the personal column but it is for businesses. Another column on the menu is the corporate & institutions and the wealth & investment column. These refer to commercial banking services for individuals and house-holds. Here, they create services tailored for the regular joe who might have the need to perform banking transactions. Personal banking is not limited to opening standard bank account, it is much more than that. Personal banking includes borrowing, insurance, investing and self-service banking. The standard bank personal banking is tailored to meet your banking needs as an individual no matter whom you are. It involves creating a standard bank account, applying for credit cards, savings and investment and so much more. Personal borrowing tries to individual house holds the option of borrowing in order to meet their obligation on both long and short-term basis. These borrowing can be negotiated in such a way to suit your budget needs. Here you can apply for standard bank home loans. There is also investment and savings, standard bank insurance and self-service. Standard bank tries to aid African businesses no matter what economic stage they are in. This is because they are aware that they are the largest business bank in Africa and the duty that comes with it. They provide professional expertise on products offered to African businesses. In addition to this, they offer distribution to a global audience and a strong ability to meet your needs anywhere. Standard bank business banking provides business loans which are tailored to meet you financial needs. They also provide other services with include investment, banking, insurance and specialized services. Standard bank insurance aims at protecting your assets from damage and ensure that they are properly insured. Their specialized services provide services designed to need the peculiar needs of your company. Their investment segment looks to aid you make the right savings and investment decisions. So that you can meet the goals you set for your business. Standard bank thrives to be the foremost corporate and investment banking business across. They are focusing heavily on natural resources such as mining, metals and oil and gas. The corporate and investment banking sector is dedicated to the growth of Africa in this sector. They provide services and solutions to governments, parastatals, larger corporates and financial institutions. They are also experts in other sectors such as healthcare and pharmacy which are relevant for countries. The wealth and investment sector caters to individuals and firms which have a high net worth. The clients in this category normally have a network of $1million and above. They thrive to improve the image of standard bank group by becoming the leading wealth and investment bank globally. The standard bank wealth and investment sector thrives to teach customers about wealth and investment. It achieves this through the wealth and investment leadership academy. This academy teaches family and friends of customers about banking lending, investing, financial planning and much more. Anyone can reach the bank at any time through their mobile phones, email address and through social media. By social media, we mean twitter, Facebook, LinkedIn and YouTube.